Analysis: In rushing headstrong into a summit with no agenda or goals, Trump failed on the world stage. The matchup between Trump and Putin, a skilled former KGB spymaster, was never going to be a fair fight, especially because Trump barely seemed to prepare for his biggest test on the world stage. Instead, the president chose to spend the weekend before Monday’s summit at his Turnberry Golf Resort in Scotland. Watching the performance in Finland’s Presidential Palace, Putin’s spokesman Dmitry Peskov was gleeful. Wily Russian Foreign Minister Sergei Lavrov was practically licking his chops, declaring the meeting “better than super.” Better than super, indeed, for Russia. But where does that leave the U.S.? "My people came to me, (Director of National Intelligence) Dan Coats came to me and some others. They said they think it's Russia. I have President Putin. He just said it's not Russia. I will say this, I don't see any reason why it would be." In fact, Coats and his predecessor, James Clapper, did not say they “think” it was Russia who interfered in the 2016 election. They said it was Russia, and that it started at the top. Special counsel Robert Mueller’s indictment of 12 Russian military intelligence operatives, announced by Deputy Attorney General Rod Rosenstein on Friday, was a marvel of forensic intelligence, not only naming the Russian government's cyber-spies but identifying their keystrokes, their malware and their headquarters. The indictment essentially told Putin: "We know you did it. We know how you did it. We are in your system. You can’t make a move without us detecting it." Virtually any president other than Trump could have been expected to say publicly that he had warned Putin not to do it again — especially after Coats had warned on Friday that the warning lights were blinking red again of a Russian cyberattack, the way they were warning of a terror attack before 9/11. 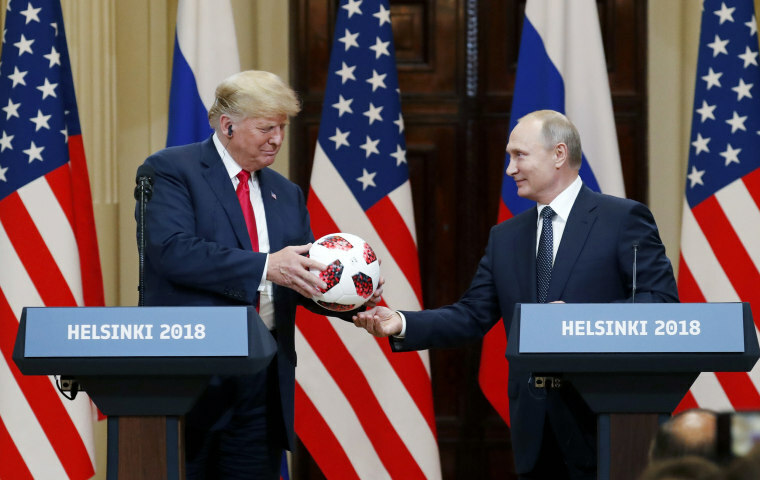 In rushing headstrong into a summit with no agenda or goals, Trump failed on the world stage, and his failure telegraphed that his erratic performance across Europe last week was not an anomaly. For the first time in 70 years, NATO allies doubt the resolve of a president against what they see as a hostile Russia. They are not willing to ignore Putin’s invasion of Ukraine and annexation of Crimea, his military bailout of Syria’s Bashar al Assad, the poisoning of British nationals, and the shooting down of Malaysian Flight MH17 four years ago Tuesday, none of which were apparently challenged by Trump in his meeting with Putin. Trump said Monday that the U.S. relationship with Russia “has never been worse than it is now. However, that changed as of about four hours ago.” In reality, what changed is that there are no more illusions about Donald Trump’s ad hoc diplomatic adventures. Republicans are now going to be under greater pressure than ever to rescue him from his own worst instincts.